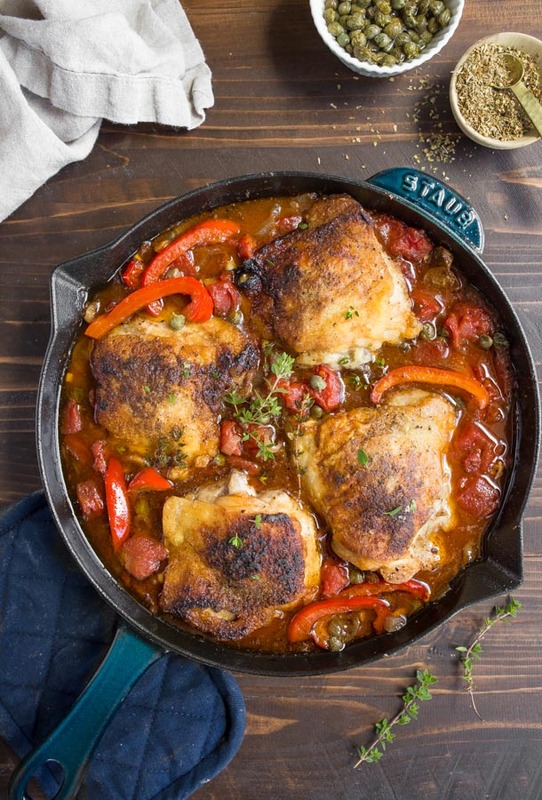 Chicken Cacciatore recipe for two, your new easy skillet dinner for two. 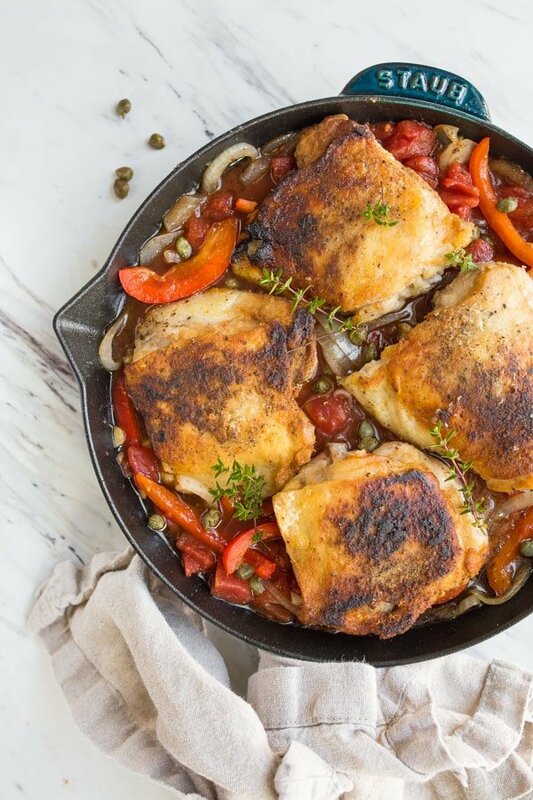 Chicken and peppers in a rich tomato and caper sauce, all made in one pan! In an ongoing attempt to come up with cozy one-dish dinners for two, I’m bringing you this easy chicken cacciatore. Everything is made in one pan, and the flavors are so hearty and satisfying. I could mic drop right now and let this dish speak for itself–that’s how good it is. Never underestimate the power of braised meat! Any time protein is seared over high heat and finished in a warm oven with a sauce, good things happen. If that meat also happens to be on the bone and still have the skin attached–even better! You’ll notice my tiny cast iron skillet (it measures slightly more than 9″ across and is made by Staub), has 4 chicken thighs in it. I love bone-in, skin-on chicken thighs not only for their flavor, but because they’re usually sold 4 to a package–they’re made for dinners for two! Every time I buy meat, I pull out my Food Saver to vacuum seal and store the rest in the freezer, but not when I buy chicken thighs. Yes, I know you can get a better deal buying a giant package of 27 thighs, but be honest with yourself–are you going to freeze them promptly and remember to use them before they get freezer burn? I’m only moderately good at remembering what’s in my freezer, and I spend all day in the kitchen, so take some help, reduce food waste, and buy the small pack! Let’s talk about the basic premise of this chicken cacciatore recipe. We’re basically searing chicken to give it a golden brown crust, and then nestling it back in the pan in a juicy sauce before sliding it into the oven. -Sprinkle each chicken thigh liberally with salt and pepper. -Dredge each chicken thigh in a shallow dish of flour seasoned with salt and pepper. -Sear the chicken over high heat; don’t worry about cooking it through. -Remove the chicken from the pan, and add everything else. All of it–tomatoes, wine, peppers, onion, garlic and herbs. -Nestle the chicken gently back into the pan. To keep the crust crisp, don’t dunk it in the sauce. -Bake, and serve with the same wine you used in the sauce. Got it? Now all you have to worry about is what to serve with it. Here’s a photo of what it looks like before you slide it into the oven. The peppers and onions are softened, but the sauce isn’t thick enough yet, and the chicken isn’t done on the inside. 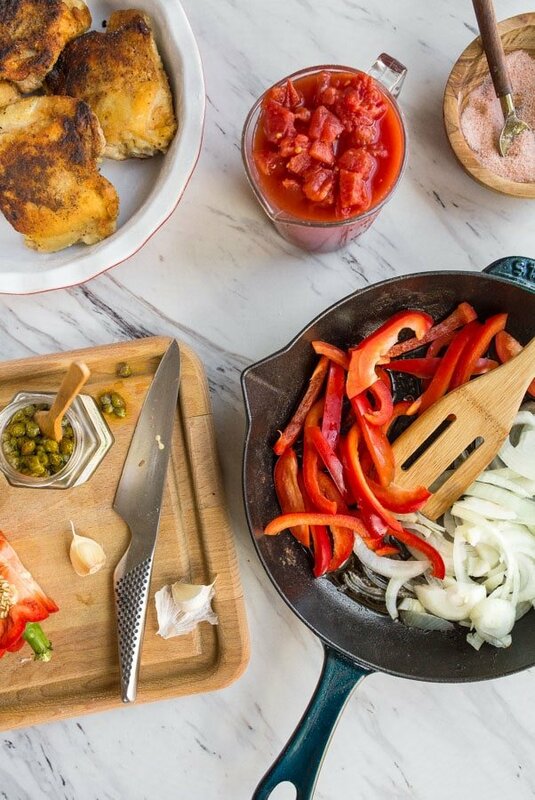 After a 25-minute bake, you’re in chicken and peppers heaven! Upon first taste of this chicken cacciatore recipe right out of the oven (ow! ), I decided we needed a starchy carb to soak up the pan juices. The tomato and wine sauce with fresh herbs is way too good to leave in the pan! On a lazy night, I serve it with bread; when I’m the best version of myself, I thicken the sauce with cornstarch and serve it over pasta. To thicken the sauce using the cornstarch method, just whisk 1 tablespoon of cornstarch into 1 tablespoon of cold water. Once the dish is done cooking, remove the chicken from the pan and whisk the cornstarch mixture in the skillet. The residual heat will thicken the sauce; if it doesn’t (or if you’ve waited too long to do this), just place the skillet back on the stove top to warm through. Once the mixture comes to a bubble, the cornstarch will start to thicken the sauce. Sound like a lot?– serve it over mashed potatoes. 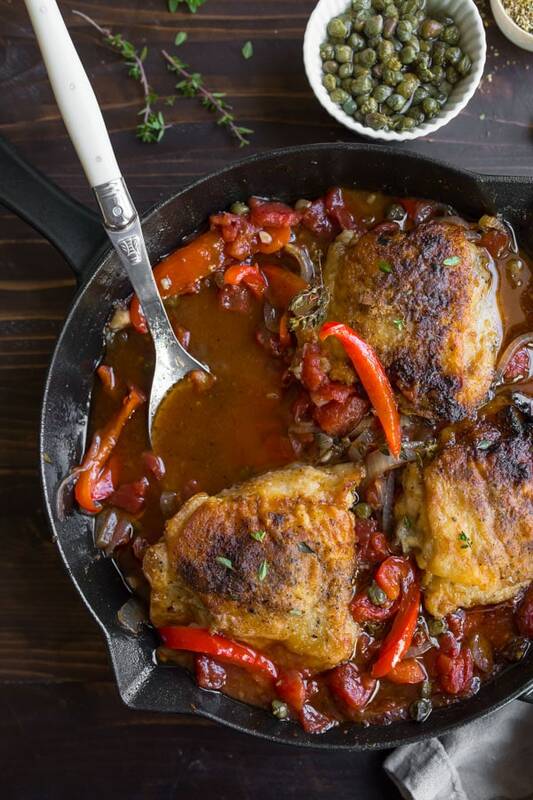 You can absolutely serve this Italian chicken and peppers on its own. However, the first time made it, we ate it plain, and then we decided it would be great with pasta. Also, I want to mention that in one round of my recipe testing, I forgot to add the wine. It tasted great, so if you’re out of wine or forget to add it, don’t worry! It will still be amazing! 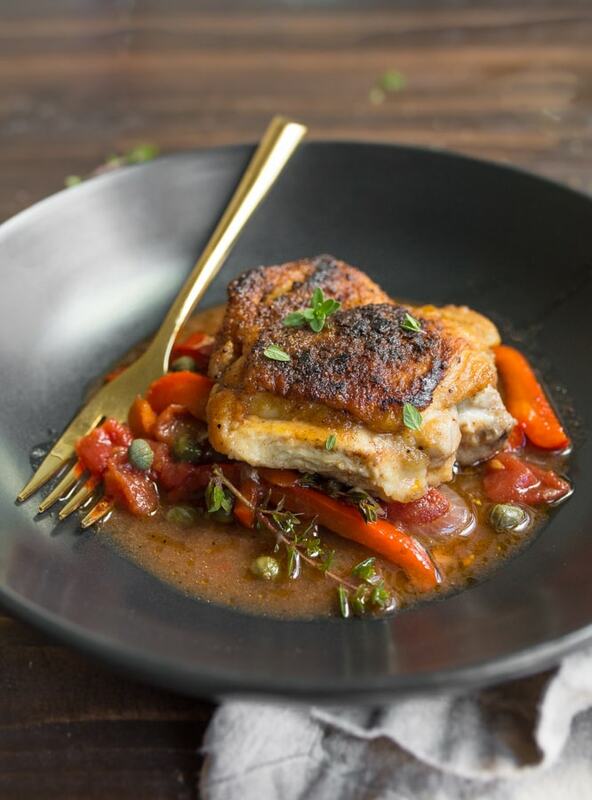 One final thing–I don’t put mushrooms in my chicken cacciatore recipe, but you can absolutely add half a box to this dish, and you will love it! Your choice! Easy chicken cacciatore recipe for two. First, place the chicken pieces of a plate, and sprinkle both sides liberally with salt and pepper. Sprinkle the flour evenly over the chicken, turning it to coat it in the flour. Add the olive oil to a 9" skillet, and place it over high heat. Once the oil is hot, add the chicken, skin side down and let it sear for 5-7 minutes. Flip the chicken when its golden brown on the first side, and sear it on the second side. Once both sides of the chicken are golden brown, move the chicken to a plate. The chicken will not be cooked through at this point. While the chicken cooks, slice the onion into half-moon shapes, and seed and slice the pepper into strips. Crush and mince the garlic cloves. Drain off about half of the oil from the pan that you just seared the chicken in, and then add the onions and peppers. Cook for about 5 minutes, just to soften, and then stir in the garlic, thyme, oregano, wine, tomatoes and capers. Nestle the chicken back into the pan, skin side up, and slide it into the oven for 25 minutes. After 25 minutes, test the thickest part of the thigh with a meat thermometer. It should be 165. Serve the chicken on its own, or with pasta, bread or mashed potatoes. Love this recipe, and I have the exact same pan from LeCruset it’s perfect for “Dinner for Two”. 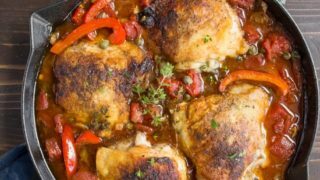 I wanted to give you a suggestion for a slight alteration of this recipe that you can use to make Spanish Chicken and Rice. Replace the capers with green olives sliced in half, add a little saffron or turmeric to the sauce and serve with yellow rice. Delish. Thanks again for all you do! Loved this recipe! Thank you. Can you recommend a favorite dry white wine of yours? I am a red drinker and always afraid when a recipe calls for white. Sure, I love a Sauvignon Blanc from anywhere in Napa. Especially Honig. I’ve made this twice now, the first time I made it with chicken thighs, as suggested. Last night I tried it with chicken breast instead. Due to the size, I only used two breasts, which I think equated to the same meat quantity as per the 4 thighs. By all means, only make this with thighs! The chicken breasts didn’t have nearly the flavor as the thighs. I should have just trusted Christina. Great recipe, as always!